Adventure Game Studio | Games | Sawn 1: Pain is just the start! 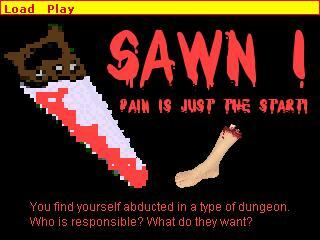 Download Sawn 1: Pain is just the start! V2.00 Now with extra sound. Sawn 1: Pain is just the start! Horror / Drama. 1 room Game. You've seen the film (Saw), you know the score. You are abducted and wake up in a dungeon with your foot clamped. There is a religious, hooded madman on the loose who has planted a tiny explosive device in your neck! You have just 5 minutes to remove it or else.. Boom, goodnight vienna as the tiny explosive will explode in your neck!! A timer will show you what time you have left to remove the device. * Can you watch if you decide to saw off your foot? * Possibly lose a finger or 2? * Will you enjoy digging an instrument into you neck? Maybe you will escape, who knows, it's possible. There are 3 possible endings. 16-bit colour and 320 x 240 resolution.